For a while now, there has been a lot of speculation about Nokia's dwindling reputation as a forerunner in the smartphone industry. This is because a lot of people are beginning to choose other brands over Nokia products. To curb this growing speculation, Nokia had to go back to the drawing board and that it how the much awaited Nokia N8 was born. 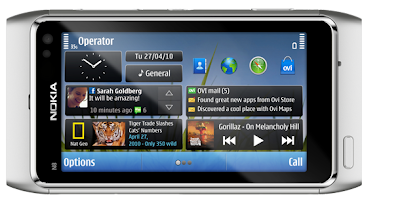 This phone was to address the issue that Nokia still had a part to play as one of the best manufacturers of smartphones. This smartphone is supposed to be the smartest of all smartphones coupled with a new OS and packed with a lot of interesting tech features. Hardware: its hardware is one of a kind. Packed with a rugged look and made from aluminium construction, there is no way you will miss this phone on sight. Though it has a big bump at the back, this is because of the camera with a Xenon flash. Internals: This Nokia N8 comes with a 680MHZ processor and a 256MB memory. I know a lot of people will have issues with the memory. it also comes with 16Gb of built-in storage and has a microSD slot which will total up to 32GB more. It also has a USB, 1200mAH battey with 802.11n wifi. Display: The cool thing about this phone that nobody seems to mention is that it is bulletproof scratch-resistant. You can scratch and poke all you want and you still wouldn’t get any scratch or dent on it. 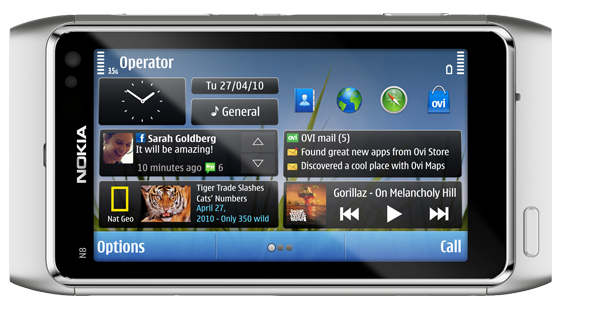 It has a 3.5 inch display with a 640 x 360 resolution. Camera: Nokia N8 comes with a whopping 12 mega-pixel. I would even buy the phone just because of the pixels. This is really a big step forward for Nokia while its competitors will be dragging behind to catch up. Speaker: I also have to give this to Nokia. They are again at the forefront of innovation. The speaker is so loud that you can actually mistake it for a boom box. For such a small size speaker, it definitely delivers. Browser: I have mixed feeling about the Nokia browser. Nokia was really one of the initial companies that started using WebKit for phones. Nokia should have done much better here because their browser does not differ too much from other mobile browsers. You will only get better performance and quality by browsing mobile optimized sites.